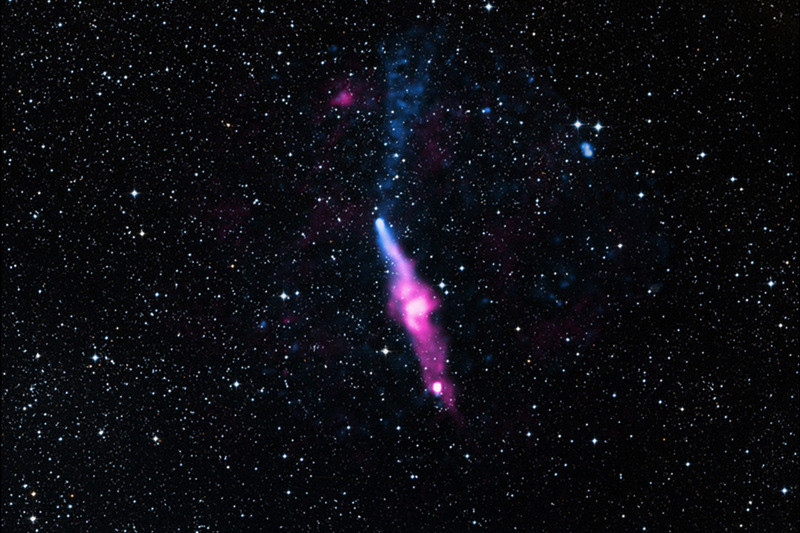 The pulsar in the image above, PSR J1509-5850, is located about 12,000 light years from Earth. Rochester Institute of Technology’s Center for Computational Relativity and Gravitation (CCRG) and Insituto Argentino de Radioastronomía (IAR) are beginning new systematic pulsar timing studies. Pulsars are the highly-magnetized, rapidly rotating relics of dead massive stars that we can detect by the radio pulses they emit at regular intervals. Due to their precise spins, scientists can use them to study topics including magnetars, gravitational wave sources and their electromagnetic counterparts. RIT is helping IAR upgrade its two radio telescopes to get them operational again after decades without use. Already their work together has yielded significant scientific observations including identifying a new magnetar and a millisecond pulsar. New faculty and student research exchanges between the two schools are already underway. Lousto traveled to IAR to design new equipment and deliver lectures and IAR Ph.D. students from Argentina have already visited RIT as well. RIT plans to develop a remote control, large data storage and an analysis center at the Rochester campus to study observations made by IAR’s antennas. “This collaboration will give unique possibilities to our students because they will have access to direct observational data,” said Manuela Campanelli, director of the CCRG. “We are excited to work with IAR to make new discoveries in the field of multi-messenger astrophysics.” Campanelli is the leading principal investigator of several large collaboration of researchers, funded by NASA and NSF, which are providing the first calculation of the characteristic light signals from supermassive black hole mergers at the center of active galaxies. RIT and IAR’s observations will contribute to the larger efforts of the North American Nanohertz Observatory for Gravitation Waves (NANOGrav), a collaboration of scientists working to detect and study the impact of low frequency gravitational waves passing between the pulsars and the Earth. Using pulsar timing observations, the NANOGrav collaboration is striving to discover a supermassive black hole by 2022. RIT will host the NANOGrav collaboration for meeting Oct. 14-18. To learn more about RIT’s CCRG, go to http://ccrg.rit.edu.